Seung Chan (Slim) lives to create a world where we all have the choice to treat our psychological discomfort and interpersonal conflict as leverages, not hurdles, for innovation. Seung Chan (Slim) was born in Seoul, (South) Korea. Since the age of 6, he has moved from one country to another every 5 years or so. 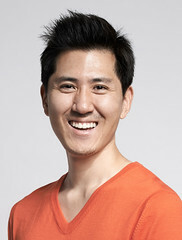 After living in Korea, Egypt and China, he moved to the U.S.A in 1995 for college, where he currently resides. As an executive coach & human interaction designer, Slim personally guides and accompanies CEOs — especially founders of growth stage startups — on their journey of innovation. By helping us (re)design our relationships and interactions not only with our co-founders, employees, and clients, but also ourselves, he shows us how leading a team through the innovation process can become less a source of energy drain or frustration and more a source of confidence and clarity. Having recently turned 42, Slim has spent 20 years exploring the role of design & empathy in creativity & innovation. He coaches CEOs and executive teams across North America, Asia, and Europe. Most notably, he has coached nearly 100 leaders through Singularity University’s Global Solutions program and SAP’s Mentors program. Slim is the author of the award-winning book "Realizing Empathy." He has shared the message of this book with over 15,000 people across North America, Europe, Asia, and the Middle East. Slim’s career started at MAYA Design (A Boston Consulting Group Company) helping fortune 500 companies innovate through human-centered design. From this experience, he learned that companies struggling to innovate have to overcome their unawareness & bias toward their customers before they can innovate. The muscle required to do so? Empathy. He then conducted anthropological research at the Rhode Island School of Design and Brown University on how artists innovate differently from human-centered designers. From this experience, he learned that visual & performing artists struggling to innovate have to overcome their unawareness & bias toward themselves, their subject matters, or their materials before they can innovate. The muscle required to do so? Empathy. Slim now personally guides CEOs on a journey of innovation. From this experience, he sees that CEOs are like artists: overwhelmed with so much uncertainty and complexity that it’s no wonder they feel lonely, isolated, and anxious. So he starts by helping them manage or overcome the unawareness & bias underlying such uncertainty, complexity, loneliness, isolation, and anxiety. Why? So they can more effectively lead their organization through growth & innovation. How? By helping them develop the muscle required to do so. Empathy. “Being present to a vulnerable expression of honesty is a privilege. It surprises us, challenges us, and reminds us of what it means to be human. It is what gives us the courage to vulnerably express our own honesty. “Many of us are trained to perceive all conflicts as problems to be solved. Most conflicts are not problems, but paradoxes. “Paradoxes cannot be solved. They can only be dissolved by learning a new perspective, where the conflict no longer is. “To empathize is to feel connected or at one with what we could have otherwise objectified or felt separated from. “To realize empathy we must notice ourselves objectify or separate, then choose another way of being. Difficult under stress! “Demanding diversity and inclusion is easy. What’s difficult is navigating conflicts that arise amidst diversity and inclusion. “It isn’t mere diversity and inclusion we need. It’s unity amidst diversity and inclusion without conformity. This is impossible without empathy. “Without the ability to realize empathy amidst conflict, diversity and inclusion can merely fuel fragmentation and resentment. “Empathizing may accompany feelings of resonance or coherence, but those are not objective measures of understanding. “Verification alone can determine the accuracy and precision of our understanding. Yet, no method can verify perfect understanding. “We can empathize and still misunderstand. That’s not necessarily bad. I find it presumptuous to claim we understand.